Last week I realized my long cherished dream of visiting the Chilika lake. Had caught some glimpses of the vast expanse of this lake (the geographically correct term would be 'lagoon' or a area of sea water separated from the ocean by a reef/sandbar) during my train journeys on the Hyd-Bbsr route and had been mesmerized ever since. Though it is merely a two hour jouney from BBSR (which is my in-laws place), something or the other kept coming up during our Odisha trips and we could never make that trip. That is until last week when destiny finally smiled on me ( my husband has been there a number of times during his school days ). For the uninitiated folks, the beautiful Chilika Lake is the largest brackish water lagoon of India. Spread out over an area of 1100 square kms , it covers the Puri, Khorda and Ganjam districts of Odisha. It host a large number of migratory birds in the winter months and offers a whole plethora of scenic spots within the periphery of the water body. We started off quite late from BBSR as we were in a big group and everyone took time to get ready and reach the starting point. It was almost 11:30 am by the time everyone got into the car . Though we had booked an Innova for the trip, it felt a bit cramped as there were 10 of us including the driver and two kids. Except for a 5 min halt to sip some sugarcane juice and sample dahi bara-ghuguni-alu dum, we travelled without any halts and reached Balugan by 1:20 pm. The trip was planned for a Wednesday as it is one of those days (the other being Friday) where everyone can indulge in non-veg food without offending any God or Goddess (strictly in accordance with Odia culture, others please excuse). On reaching Balugan, we headed straight to the Chilika Dhaba, which is touted as the sea-food Paradise of Odisha. Though it looked quite nondescript, the sheer number of people who were having their meals here baffled us. There were different sitting areas designated for different sections of travellers or more importantly different budgets. The waiter guided us to a dining hall which was exclusively meant for families/couples. We ordered for crab, prawns, chicken and fish ("pohola", a local delicacy) along with rice, dal, papad and mineral water. The food was served in about 15 mins. Everything turned out to be delicious though the prawns were a bit overdone. To finish it off, we ordered for some masala cold drink. At the end of it, we were handed over a bill of Rs 1600 which sounded too good to be true. Getting back to the car, it took us another 5-10 mins to reach PanthaNivas/OTDC, Balugan. Walking towards the lake, I started to lose my nerves and was literally shaking by the time we got into the boat. Though there are quite a few kinds of boats to choose from, the elders decided to go for a old fashioned motor boat. It had no lights, no life jackets and some rod kind of thing which the old boatman used for steering the boat. Though I thought that it made more sense to go for one of the hi-tech boats, I was too scared to mouth any kind of disapproval at that moment. My fears kept rising as the boat moved away from the horizon and the likeness of any civilization grew increasingly smaller. After around thirty minutes we reached a point where we were completely surrounded by water and there was no sight of any shore. This was the point where I was so taken by the glorious beauty of nature that I completely shed any lingering fear and started to truly enjoy the sights. We saw quite a few varieties of birds like the sea fowl which was serenely sailing along the waters, some were swooping down to catch fish, a kind of crane/ergot standing on one leg on a protruding piece of rock and flocks of white,black and yellow birds (sorry but I am no good with those names) flying very low over the waters. We also caught a lone fish jumping out of the waters. The golden rays of the setting sun had colored the lake in beautiful hues of green, blue and red. No wonder that the beauty of this place during the dusk has inspired a beautiful Odia poem 'Kalijai re sandhya'. We were headed to famed temple of Maa Kalee Jaee/Kalijai, the reigning deity of the lake. Legend attributes the birth of the Goddess to the appearance of the spirit of a young woman who drowned while traversing the lake to reach her husband's home situated on the other side of the lake ( a village by the name of Parikuda which still exists ). While her own life was tragically cut short by the cruel waters of the lake during a storm which suddenly engulfed the boat, she decided to save others from a similar fate. To this very day, people offer their prayers to the Goddess while boarding a boat on this very lake. Folklore depicts her as a 'pratekshya devi' or an omnipresent force who appears whenever her devotees are in distress and some people say that her cries are still heard on the island during the dark stormy nights. We reached the island just as the evening prayer (or 'aarti') was about to begin. Though small, the temple has a unique charm of its own. 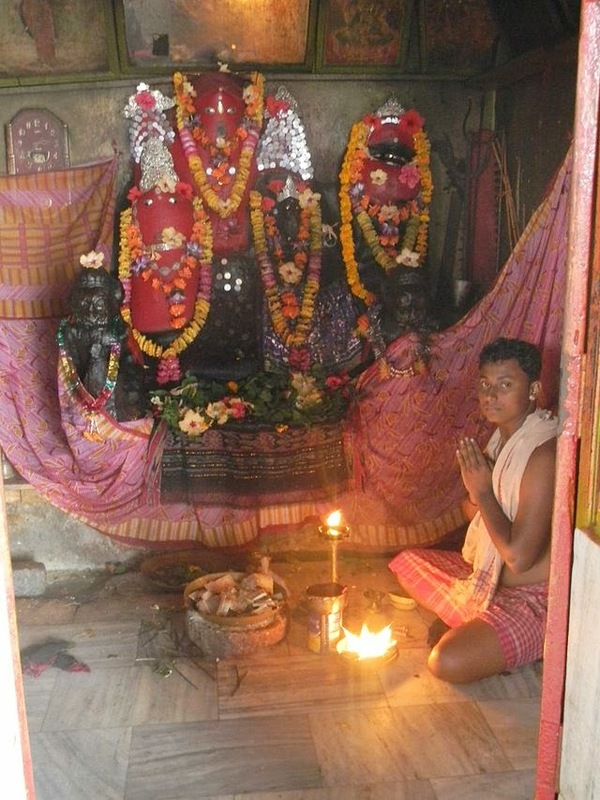 There were loads of 'lali sankha' (or the red bangle that married women in Odisha wear) tied almost everywhere by the women folk who pray to the Goddess to keep their marriage intact. We also caught some friendly goats and chicken running around on the island. An elderly member in our group informed me that those animals had been gifted to the Goddess by the devotees whose wishes had been fulfilled. The most important festival here is the Makar Sankranti during which a fair called the 'Makarmela' is organised on the island. I made the return journey in a great state of mind as a long cherished dream had been fulfilled. The Goddess had finally answered my prayers. So lovely that you visited. Kalijai is on my list for long. Should be there this year-end!